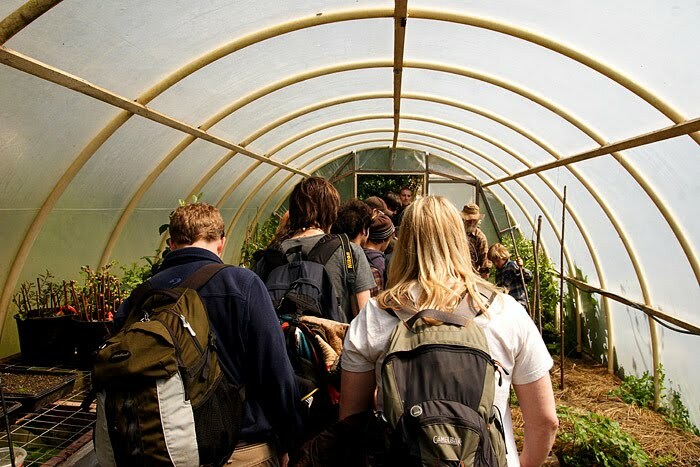 As the Alderleaf Certification Program moves towards a close, we have completed our final days of Permaculture. To celebrate our year of learning and practicing permaculture ideas and techniques we traveled to one of the oldest running permaculture farm in the country: the Bullock's permaculture homestead. Our day started with a beautiful ferry ride into the San Juan Islands. The Bullock's homestead is located on Orca's Island, in Deer Harbor. The homestead is in a micro-climate within a micro-climate, being in a sunny part of WA state and on a sunny Southwest facing hillside. 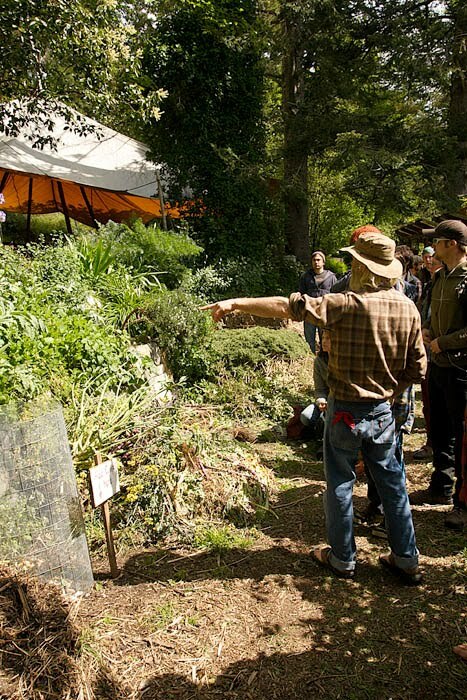 This incredible nearly 20 acre property is a shinning example of permaculture in action. It is impossible to capture in words all of the intricate systems, mind-boggling variety of plants of countless shapes, colors, smells and tastes that cover the land in a riot of diversity! Doug Bullock was our host and tour guide for the day. His many years of experience around the world applying permaculture principles in places such as New Zealand, Hawai'i, Australia, Costa Rica, Nicaragua, California and Washington. His knowledge of plants and ecosystems from these and other areas is awe-inspiring. Here Doug is pointing out the huge leaves of an edible plant from South America who's stems are chopped up and eaten raw. Plants at the Bullock's homestead grow abundantly, intermixed in to many different guilds. Plant guilds are a grouping of plants grown together for the mutual benefit of all. So that every species in a guild supports the other, making them all more vital, healthy and productive. Here Doug leads us through one of several greenhouses on the property. Here many of the farms plants are propagated and plant cuttings are rooted to be sold or for planting throughout the property. The amount of food produced on the farm has to be seen to be believed. Another gem of the Bullock's homestead is this (see photo above) several acre wetland. When the Bullock's purchased the property, the observed that there was an old drainage ditch coming out of a field. They quickly chose to dam the drainage and let the water pool up. 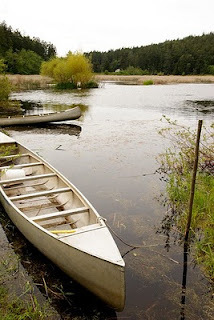 In a short time, it turned into a wetland which they helped along with planting a variety of native vegetation. They introduced some fish as well as native amphibians and turtles. The wetland has become a thriving ecosystem, which has been designated a birding hot spot, with over 100 species observed there! Doug described how even here, humans are part of the land. The needs of both wildlife and humans can be met, and both can thrive. One way that the Bullock's utilize the wetland is using a very old method of forming growing islands, called "chinapas" that were used in southern Mexico by the Aztecs. The technique involves digging up material from the bottom of the wetland, and piling it up with brush and other materials to make small island. Food bearing plants that enjoy moisture are grown on these islands. It also creates foraging and nesting habitat for a wide range of wetland species. The Bullock's farm was truly an incredible location to experience and one of the finest examples of a working permaculture homestead in the world. It was a treat and an honor to visit. We all look forward to another trip there in the next school year!